vacancies in 8 JNV's. Candidates who are qualified 12th and having typing knowledge in Hindi and English they can submit their application form online form 12-11-2017 to 13-12-2017 via the official website of Navodaya Vidyalaya Samiti NVS websites @www.nvshq.org or www.nvsnt2017.org. Candidates will be selected for this NVS LDC/Storekeeper jobs through Computer Based Test and Skill/Typing Test. For more details about this NVS Storekeeper Jobs see the below given details. 10+2/12th pass with Secretarial Practices and Office Management as Vocational Subjects. Candidates age limits are 18-27 years and for SC/ST candidates 5 years, for OBC candidates 3 years of upper age relaxation is given. Candidates will be selected through online test of computer based and skill/typing test on computer. Exam Application fee is Rs.750/- and no fee for SC/ST/PWD and Ex Servcieman. 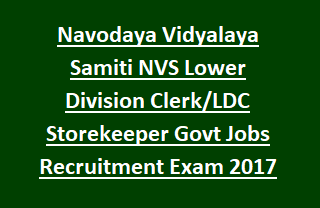 Apply Online here for Navodaya Vidyalaya Samiti LDC/Storekeeper Jobs.